This development regenerated an aged and highly constrained site in the heart of the West End, adjacent to Piccadilly, ultimately delivering almost 10,000m2 of commercial, retail and residential accommodation. The renovated building, developed by The Crown Estate, The Crown Estate in partnership with the Healthcare of Ontario Pension Plan, is located in the heart of the West End and features 6,000m2 of premium office space, as well as 2,000m2 of retail and 1,700m2 of residential space. The scheme involved a redevelopment of an urban block in a dialogue with the existing buildings in two conservation areas (Regent Street and St James’s) with both conserved and new façades replacing six former buildings. 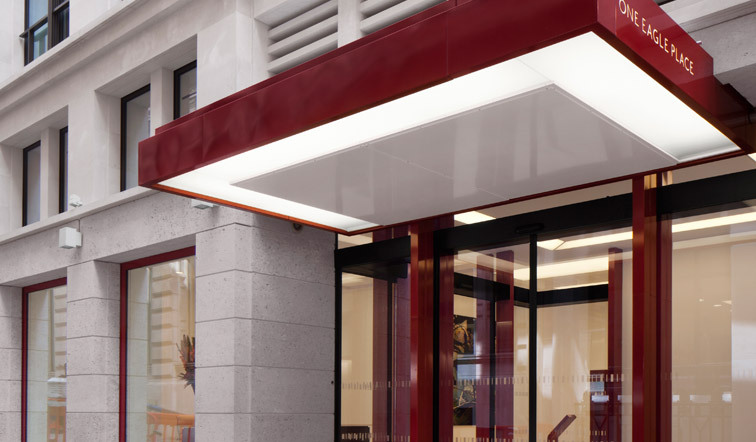 Waterman was involved from early design development and worked closely with Eric Parry Architects to develop an integrated structural/façade backing system to provide a substrate from which to support hand-set faience and Portland Stone. The system utilised a concrete encased structural steelwork moment frame with halfen channel fixings. Early contractor involvement from both the steelworker and cladding contractor was key to the successful development of this solution. This provided programme benefits on site, enabling the early installation of windows and weather proofing of the building and also cost benefits with the removal of the need for an independent concrete grey-back system. This enabled the structure/façade zones to be integrated, maximising floor area and providing a flat face to the rear of the façade. The scheme utilises ground source heat piles to achieve a BREEAM Excellent rating, a Code for Sustainable Homes score of Level 4 for the new building and 3 for the refurbished building and an EPC rating of B. The project was awarded the BCO National Award for best commercial workplace in 2014.